The Waterford features an open concept kitchen with island and snack bar,corner pantry, granite counter tops with staggered maple cabinets & crown molding, soft close doors & drawers, GE Appliances, painted crown molding in Dining Room, Master Bath includes oversized tile shower w/ swing door, his/her vanities, and tile flooring. Home includes gas fireplace with stacked stone & taller mantle, painted trim and door pkg, solid core doors, basement is stubbed for future bath, 11' ceiling in the great room, foyer, and dining room, 2X6 construction, Pella windows, Focus on Energy Certified, and much more! Driving Directions: I-94 to Exit G/Meadowbrook Rd. toward Waukesha/Pewaukee. South on Meadowbrook Road. L on Hwy 59. R on Genesee Rd/Saylesville Rd. L on River Rd. L on Lawnsdale Road. R on Huron Ln. L on Mohican Trl. 1423 White Deer Trl #Lt6, Waukesha, WI 53189 (MLS# 1614467) is a Single Family property with 3 bedrooms and 2 full bathrooms. 1423 White Deer Trl #Lt6 is currently listed for $489,900 and was received on November 16, 2018. 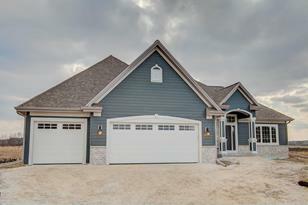 Want to learn more about 1423 White Deer Trl #Lt6? Do you have questions about finding other Single Family real estate for sale in Waukesha? You can browse all Waukesha real estate or contact a Coldwell Banker agent to request more information.